Madras White Buffalos beat Corbett Cardinals 3-1, tie with North Marion Huskies 1-1. The White Buffalos girls soccer team ended their match Sept. 19, against North Marion, with a 1-1 tie. "They play a possession game and definitely had more possessions," head coach Shawn Darrow said. "We had some opportunities, but were not able to put them away. It could have easily been 2-1 us or 2-1 them." The Huskies scored on a penalty kick with 10 minutes left in the first half. A Madras defender was called for a hand ball inside the goalie box and North Marion was able to capitalize on it. The Huskies took a 1-0 lead at intermission. "The girls responded well to that first penalty kick, having to deal with it," he said. "They were pretty bummed about it at halftime, but they came in after half and turned it around. We responded well in the first minutes of the second half, creating a lot of chances." "I told the girls at halftime we will get one and I knew we would. They were confident in getting goals this season, as well," Darrow said. Madras scored on a penalty kick of their own 10 minutes into the second half on a handball called on the Huskies. Senior captain Erika Olivera made the penalty kick and tied the game at 1-1. Neither team could break the tie and the score remained a 1-1 tie at the end of the game. "The tie was huge and it (North Marion) is a tough place to play," Darrow said. "Their field does not fit our style; it is really short and really narrow. The short field hurt us a bit, so it was nice to get a point over there." "We work on our defense a lot and Genesis (Quiroz) and Jalaney (Suppah) have done a great job for us," he said. "They have been able to build and grow together really well." 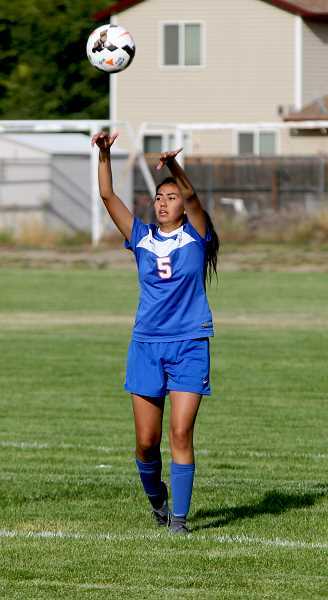 The Madras girls soccer program kept things rolling with a 3-1 victory over Corbett Sept. 17. The White Buffalos moved to 4-1 overall and 1-0 in league after last Monday's win. The Corbett Cardinals came out aggressively, controlling most of the action in the first five minutes. The Buffs responded after a slow start and took control of the rest of the half with lots of shots and scoring opportunities. Corbett only had one shot on goal in the first half, coming off a free kick. "We came out a little bit sluggish," Darrow said. "We tend to do that on Monday games. They are tough, but the team started to figure things out as the game went on. We had some solid contributors because we were out five girls today. So, it was nice to see some of these other girls step in and contribute a bit." The Buffs ended the first with a 1-0 lead over the Cardinals. Jackie Zamora dribbled the ball from midfield for a breakaway, taking a shot on goal. Zamora shot from 15 feet out and blasted the ball over the Corbett goalie, for a 1-0 lead. Madras scored early in the second half with a goal from Brideida Carlon. Carlon dribbled toward the goal in the middle of the field and took a left foot shot with a defender on her hip. Carlon's goal advanced the Buffs' lead to 2-0. The Cardinals responded with a score of their own off a free kick. Layel Parker, of Corbett, sunk a shot past a wall of defenders and a diving Cheydon Herkshan (goalie) for Corbett's first score of the game. Madras still had a 2-1 lead with around 13 minutes left in the half. At midfield, Erika Olivera passed the ball to a sprinting Jackie Zamora for a perfect pass in stride. One on one with the goalie, Zamora took a hard shot blocked by the Corbett goalie. The shot flew in the air and Zamora, not giving up on the play, kicked a second shot out of midair and scored for the Buffs. "The team had a lot of chances; we finished a few and we held pretty strong," Darrow said. "The defense got unlucky with that free kick, but beyond that, I was pretty happy with the effort, especially in the second half." Madras finished the game with a 3-1 win over Corbett. In their first four games on the season, the Buffs have outscored opponents 8-4 in the second half. 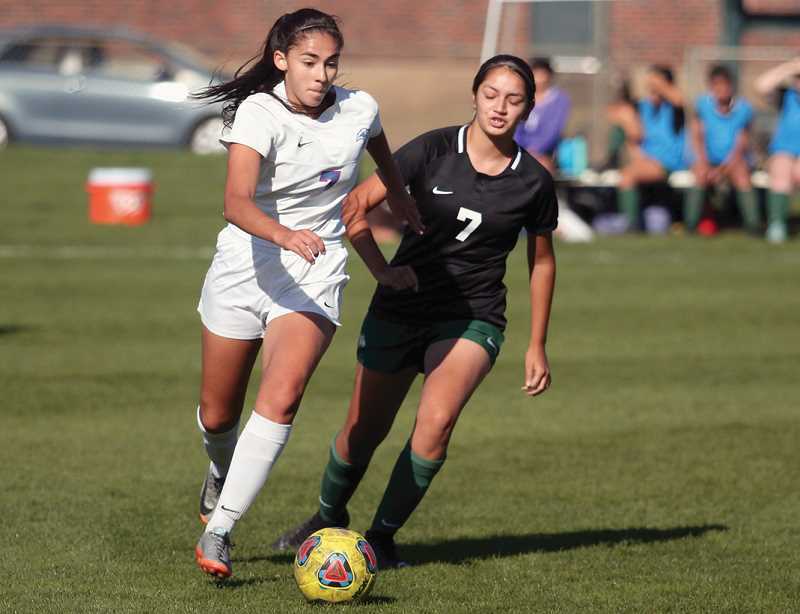 The team has already surpassed the number of wins they had in last year's season and before the 5-2 win over Mazama Sept. 13, the team had already matched the number of goals scored all last season. "Last season, our motto was, 'You can't lose if you don't get scored on,'" Darrow said. "This season, it has been more, 'Bend don't break' goal-wise, but also scoring a lot more goals, as well. We have a lot more confidence this year to get goals back." The girls have their next home game Oct. 2, when they take on the Estacada Rangers at 4 p.m.